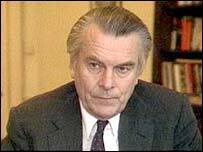 Nothing but nothing will ‘reverse ethnic cleansing’ (David Owen’s initial aim) except a military defeat inflicted upon Serb forces in Bosnia-Herzegovina (and David Owen was employed, of course, exactly to try and forestall the necessity of Western military action by persuading the Serb forces to abandon their maximal aims). Without a Serb defeat there is no chance of stability for the entire region, no hope for Bosnia Herzegovina, and only black prospects for Serbia and Croatia. Of course not all of this is true. Serbia and Croatia’s prospects are not ‘black’ at present; Croatia’s haven’t been for quite some time. And David Owen might’ve indeed had the lofty aim of reversing the ethnic cleansing that went on in the first draft of his plan, but he and Cyrus Vance eventually had to own up to the reality on the ground, which was sharply slanted in the Serbs’ favor. That reality was reflected in their second plan, which was enormously unpopular in that it would’ve only solidified Serb gains. Of course it was rejected by Bosnian Serb leadership, who at that point must’ve been feeling pretty invulnerable. It’s hard to reverse territorial gains (and the terror campaigns that inevitably go with them) without an army. No one learned this lesson more bitterly than the Croats and Bosnians in this conflict. The only “plan” that would have had any success was the Carrington-Cutileiro one — because it was designed to prevent, not stop, fighting. But it was too little, too late. NB: Those who read this letters column to the end will find a young Marko Hoare going the distance over wartime nationalism in the Nazi-occupied territory of Serbia and Croatia. This entry was posted in Balkans, croatia, human rights, serbia and tagged balkans, bosnia, croatia, living marxism, milosevic, republika srpska, serbia, yugoslav wars. Bookmark the permalink.